Product prices and availability are accurate as of 2019-04-18 23:34:37 UTC and are subject to change. Any price and availability information displayed on http://www.amazon.com/ at the time of purchase will apply to the purchase of this product. 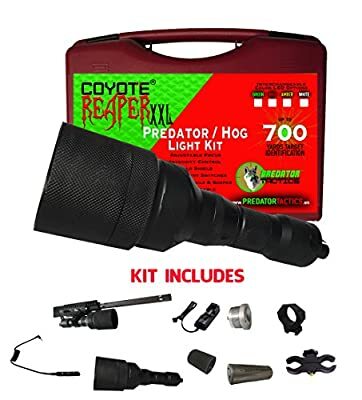 Predator TacticsTM, Inc. has once again set the bar at a whole new level in the predator hunting lights and hog hunting lights industry with the all new Coyote Reaper® XXL. The Coyote Reaper® XXL light features an adjustable focus, intensity control on/off dial on the tail cap, extended run time per battery, interchangeable LED bulb modules and packs a punch with its beam throw reaching distances up to 700 yards* of target identification. The Coyote Reaper® XXL is by far the best performing coyote light on the market today hands down. The Coyote Reaper® XXL is offered in several variations to allow you to find the right predator light or hog light for your needs.